Last year, after John Prakesh decided to leave the band and pursue other endeavours, mastermind/guitarist Thom Blunier wanted to carry on despite having to look again for a new vocalist. The other guitarist, Thomas Muster, however, was ready to call it quits. In came Chris von Rohr from KROKUS, who advised (mainly) Thom to get back in touch with Mark Fox and settle the differences from the past. And so it happened. Mark is back at the helm and ready to keep the SHAKRA train rolling. Album number ten is a fact: “High Noon” will see the light of day on the 29th January 2016. For those who are familiar with SHAKRA, you know what you get. No need to change a formula that works, although it never hurts to change some little things here and there without changing your style. It all starts with “Hello”. This firm, tight rock song is typically SHAKRA in sound, catchy chorus and simple structure, to the point. Mark Fox is back and despite an absence of 5-6 years, it’s like he never left at all. The cohesion is still there, SHAKRA are again back on track. In the title track, “High Noon”, the band opted for a more easy-going approach. Clean verses (with softer singing) link up nicely with the power of the chorus, although the pace doesn’t change, just the volume. SHAKRA is not a band of intricate and technical tours de force, just straight-forward stuff that sticks. This song does have a darker atmosphere, I found. Structure-wise, almost every song is done the same way, mainly the part where the guitar solo splits the song halfway. Mark and co. are now fully warmed up and so the pace can increase again, as the direct start of “Into Your Heart” clearly demonstrates. Speed, firmness, catchy music and headbang-friendly… plus, it’s the kind of feel-good music which is another aspect of the band’s repertoire. To suit the music, Mark also sings a bit fiercer. The middle hold a little suspense before the solo outbreak. Afterwards it’s chorus time (on repeat) and done. “Around The World” is a mid-tempo, groovier kind of song with a rhythm that reminded me of “Black Velvet” by Alannah Myles. 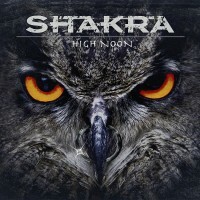 SHAKRA added its heavier sound and again chose for a vocal contrast between the verses and the (rather hymnic, by lack of a better description) chorus. Halfway it’s of course solo time, but prior to that all heaviness fades, like a “break it down” moment. The solo itself stays neatly true to the music; it’s nice to hear the Swiss adding bit of Blues into their songs. All the while, the bass and drums provide a solid basis. “Eye To Eye” has a funky character, even when the Rock kicks in. The contrast in terms of power between the verses and chorus was applied here as well. The song starts with a clean guitar line, but ends with heavy grooving. “Is It Real” is a mid-tempo Rock song like the band has made ’em for many years. Quality assured. Of course, as with every SHAKRA album, there must be a ballad. “Life’s What You Need” is that ballad, consisting, as a basis, the acoustic guitar, drums and the piano. The electric guitar is mainly there for the solo and a bit of filling, like extra power (in a small dose) in the chorus. It’s not a bad song, but they’ve made better ballads in the past. Time to rock again then: “The Storm”. The title says it all. Business as usual, SHAKRA delivering the goods once again. Another easy-going track is “Raise Your Hands”. It’s Bluesy, AC/DC-ish even, if I may say so. But it’s good. The tempo drops in ” Stand Tall” and here the band shows it doesn’t always have to be sharp-edged, speedy Rock to be good. Here too, the song had a somewhat hymnic character, at least to my ears. “Watch Me Burn” is an emotional song, not only shown via the vocals, but also the music. The verses are devoid of heavy guitars, which come out in the pre-chorus and chorus. This is another good song, but not as strong or attractive as most of the other tracks on this new release. Last but not least, fasten your seatbelt one last time: “Wild And Hungry”, which probably sums up the outcome of the reunion with Mark Fox. As you can imagine, this one rocks! It’s got high tempo, fierce vocals… it’s SHAKRA. As written above, SHAKRA has been using the same formula for several years, a formula that clearly works and pays off. These guys make catchy, accessible Hard Rock that does great on stage and gives you a boost when necessary. You could say they make the same album over and over again, and while that’s true to a certain extent, the band manages every time to make each album different via little musical tweaks. In short: You can’t go wrong with this band. It’s good to see the “old” formation back together, differences settled and another very good album up its sleeves. 2016 starts off very well!